Includes Wedding, Reception & Rehearsal Supper. Use of the building and grounds: • A 7 acre lake with a lighted pier and a lighted fountain. • There are tables and chairs to accommodate 100 at pavilion. • At "The Hitchin' Post" tables and chairs to accommodate 200 .Restrooms ,kitchen dressing rooms and shower are also amenties at The Hitchin Post.Also a beautiful front porch with a view of the lake ,pier and fountain. Sunsets are amazing and so picturesque at the venue ! • A 7 foot cedar swing by the lake, and a fire pit is included. • An old restored well shed with bucket to draw water. Just like in the old days. • There are two picket fences with rose bushes and an old wooden wagon that is perfect for pictures! • A large area for parking. • There are square hay bales in the barn that are offered to customers free of charge to use for seating or decorations at their event. You will be responsible to load and haul the hay to the event and then place it back in barn afterwards. Not Included: • Catering - can be discussed and arranged to fit your needs. The Hitchin' Post, our beautiful new wedding barn is complete and booking up! Hitchin' Post is a rustic barn with flare of elegance. The barn comes with tables, chairs, and tablecloths. It also features restrooms, dressing rooms, a shower and a retro kitchen with Turquoise appliances and huge serving bar. The barn is also air conditioned and heated for your comfort. 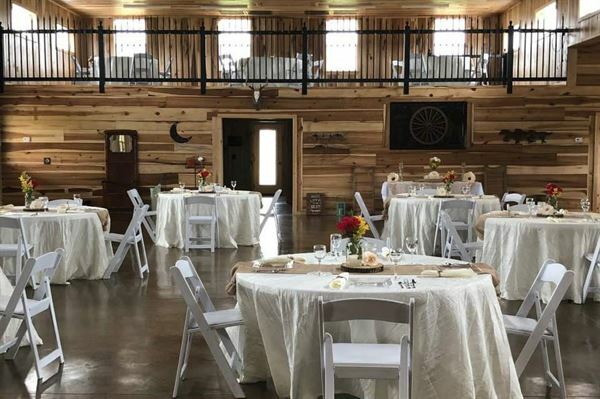 Our beautiful covered pavilion is available to use for receptions, meals, parties, and other activities.The pavilion is equipped with full kitchen and beautifully decorated restroom facilities.